The Logitech Wireless Keyboard K350 boasts a slightly curved, contoured keyboard. It could be just the thing for typists with aching wrists and tendons. But while we like the keyboard’s roomy design, padded palm rest and array of programmable hotkeys, we’re disappointed by the cheap feel of the keys themselves. You’d also need to warm to the wave-like form factor. 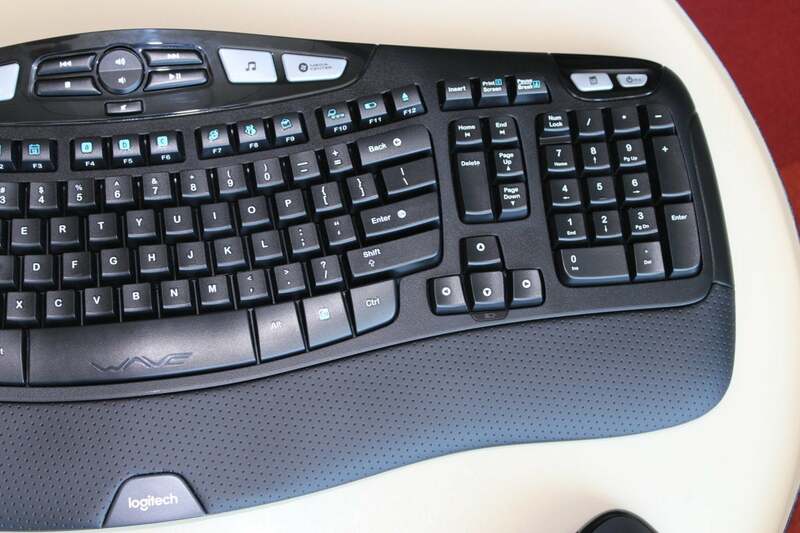 Note: This review is part of our wireless keyboard roundup. Go there for details about competing products and how we tested them. Measuring 19 x 10 x 1.5 inches and weighing about 2 pounds, 3 ounces, the K350 is one of the biggest keyboards I’ve ever tested. Indeed, if you extend its rear two-step feet to their full height (which props the keyboard up 8 degrees), the keyboard rises to a full 2.5 inches in height—so tall, in fact, that it blocked my keyboard tray from sliding back into my desk. Thankfully, the second of two steps in the retractable feet raises the keyboard only 4 degrees, shaving a half-inch off its overall height. Besides its imposing height, the K350 also boasts a padded palm rest. The keyboard itself is both slightly curved and contoured in a wave shape, creating a pair of dips roughly where the A, S, D, F, and J, K, L, and semicolon keys sit. Logitech says its so-called “Comfort Wave Design” is intended to “support the actual, varied lengths of your fingers.” We’ll delve into the actual feel of the keyboard in a moment. Another attention-grabbing design feature on the K350 is its array of hotkeys and controls, complete with a central volume toggle surrounded by media playback buttons, prominent buttons for Photo, Music, Windows Media Center (which maps to Groove Music in Windows 10), Settings and Task View, plus a Zoom toggle, hotkeys for Microsoft Word, Excel, Edge, Search, E-mail, and more. The K350 keyboard connects to a PC via the included USB Unifying Receiver, a wireless 2.4GHz USB dongle, which plugs in and works instantly without the need for drivers. The K350’s wireless connection never dropped or sputtered during my testing, and it quickly reconnected after going to sleep following periods of inactivity. While Logitech says the K350 will work only with Windows PCs, anecdotally it also connected to my iMac. Because there’s no Mac version of Logitech’s SetPoint software, however, Mac users won’t be able to customize the K350’s hotkeys. Whether the K350’s waved keyboard works for you will likely be a matter of taste. I found the contoured design to be a bit gimmicky and distracting, although I’d probably grow accustomed to it over time. That said, the slight curve in the overall keyboard shape does help keep your wrists at a straighter, more comfortable angle. Your experience with Logitech’s Comfort Wave Design may vary, so I’d urge you to try it in person to decide whether it’s a fit. As for the keys themselves, they’re disappointing given the price of the keyboard. While the sculpted design of the keys make for easy discovery, the key caps feel a tad hollow and cheap, and there’s a fair amount of clickity-clack noise as you type. On the plus side, the K350’s keys boast a solid, tactile bump in the middle of each keystroke, along with a decently springy rebound. 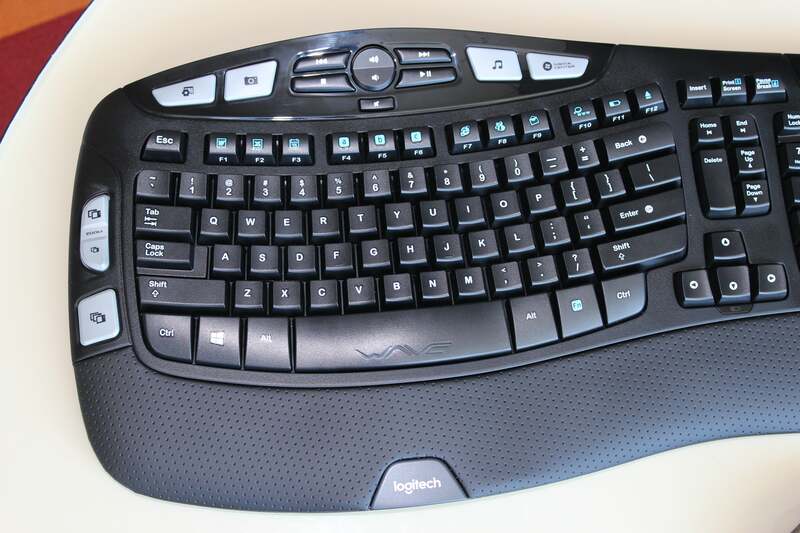 Big, roomy, hotkey-happy and ergonomically minded, the Logitech Wireless Keyboard K350 could be just the ticket for Windows users whose aching fingers need a break. That said, we wish the loud keys felt more substantial.